Stonnington Leader headline says it all. MUST READ. Too little too late timed for the pre-election period. Ministerial announcement changes nothing. DO NOT let the recent announcements about limits to 590 Orrong Rd to give you the impression that Lend Lease has been crimped.IT HAS NOT. Read this and make sure to correct anyone’s misconceptions. 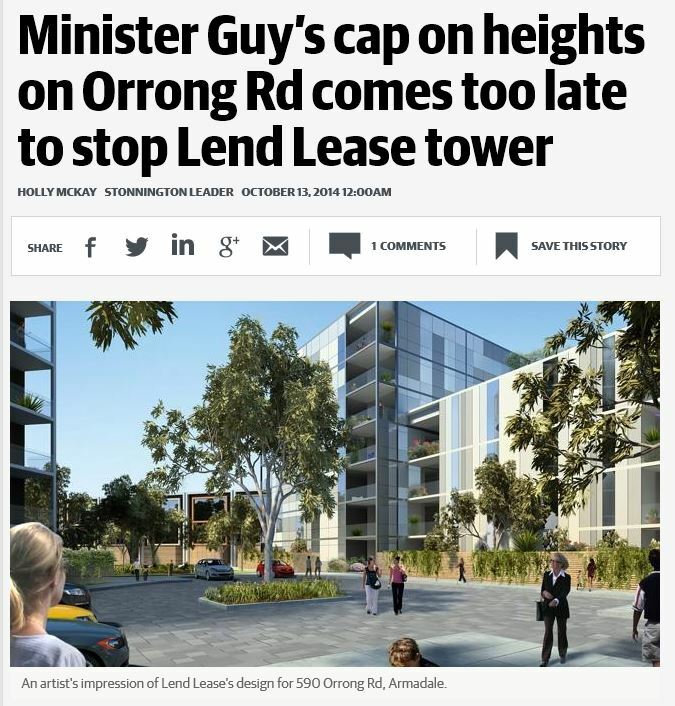 Minister Guy shuts gate on Orrong Road after developer bolted! Lend Lease still entitled to build 475 units. Now, only weeks out from a State election, the Member for Prahran announced late last week that Planning Minister Guy has approved an amendment to the Stonnington Planning Scheme known as ‘Amendment C153’ that will apply to 590 Orrong Road. This is the urban design framework or UDF that the community had been agitating for over four years. While it is disturbing that Lend Lease remains entitled to develop this site under its currently approved plans permitting 19 buildings up to 13 stories, creating about 475 units, the Community may take some comfort in Amendment C153 because it will stop Lend Lease from increasing the height or density, or other adverse changes that fail to conform with the new Amendment. The same constraints will apply if the site were to be sold to another developer. For more than 4 years, Orrong Group has pressed Local and State Governments to amend the Stonnington Planning Scheme to impose reasonable and sustainable planning restrictions on this significant site by way of an urban design framework or ‘UDF’. We argued for these UDF restrictions well before Lend Lease applied to VCAT for a development permit. Even after VCAT issued a permit to Lend Lease, we continued to argue for these restrictions. It is common for developers who have a permit to seek to increase the size of the proposed development. With that in mind, we continued to press our case to ‘ring fence’ the damage that had already been caused. 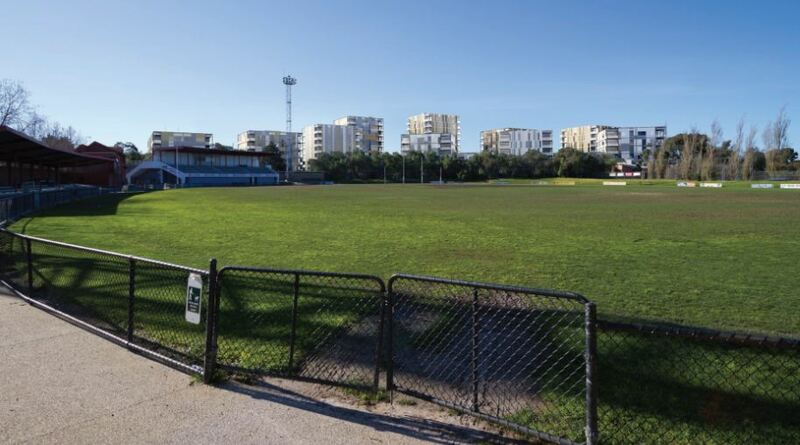 Six hundred families objected to VCAT regarding this massive CBD/Docklands style development and, with Stonnington Council’s commendable support and cooperation, the community has fought against this development at VCAT and on appeal in the Supreme Court. The Community is opposed to the approved excessive 475 unit development; the Council is opposed to the excessive development; and finally the State Government has approved the C153 Amendment acknowledging that what has been approved is excessive. The Orrong Group repeatedly petitioned this Government to keep this promise to no avail. After many months of the Council requesting the Planning Minister to put temporary planning controls on this site sitting idle on the Planning Minister’s desk, a few days before the start of the VCAT hearing, the Government refused the request for temporary controls. Refusing this request, the Government exposed the Community to the highly predictable risk of VCAT approving the permit application under planning rules this Government had severely criticized. Regrettably the approval of Amendment C153 is too late to modify the currently approved development plans The community is upset at this State Government `breaking its pre-election commitment` and will take this into account when deciding which way to vote in November. 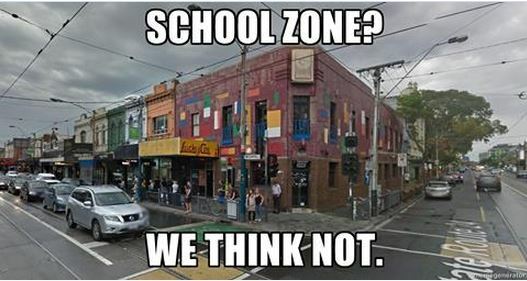 It is still open to the Planning Minister Matthew Guy to achieve something positive for the Stonnington Community. He could persuade the owner, the Hargreaves family to act as a good neighbor and direct their developers Lend Lease to reduce the size of the development or better still the Minister could compulsory acquire this perfect site for the new Stonnington Secondary School, The site is located in the centre of Stonnington, has ample playing areas and excellent public transport. The current buildings could easily be re-configured for classrooms. It would be interesting to hear also from the Shadow Planning Minister, Brian Tee. 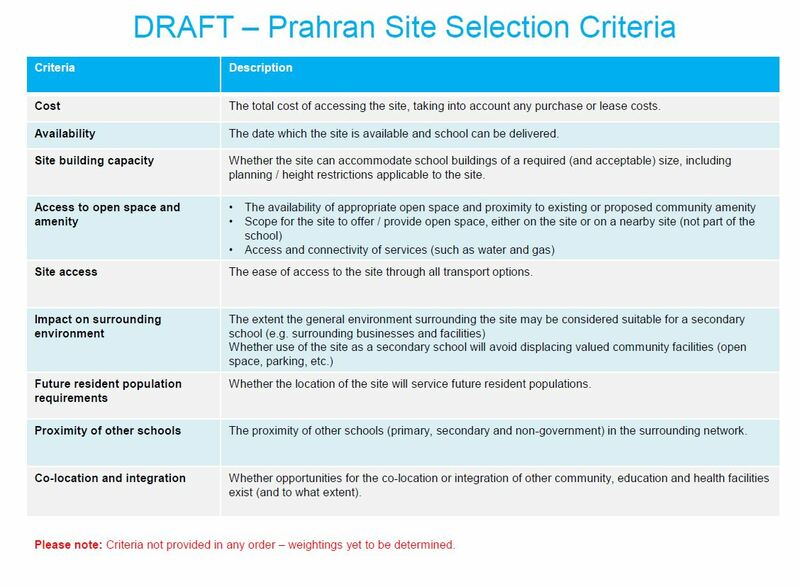 These are the criteria by which the site for Stonnington’s new school will be selected. We are concerned that the most important criterion – student safety – is omitted. We made note of this at the public meeting last Thursday. No option is safer than 590 Orrong Road. A note on site cost – whatever price is paid for the future school’s site will fade from memory over the decades ahead. 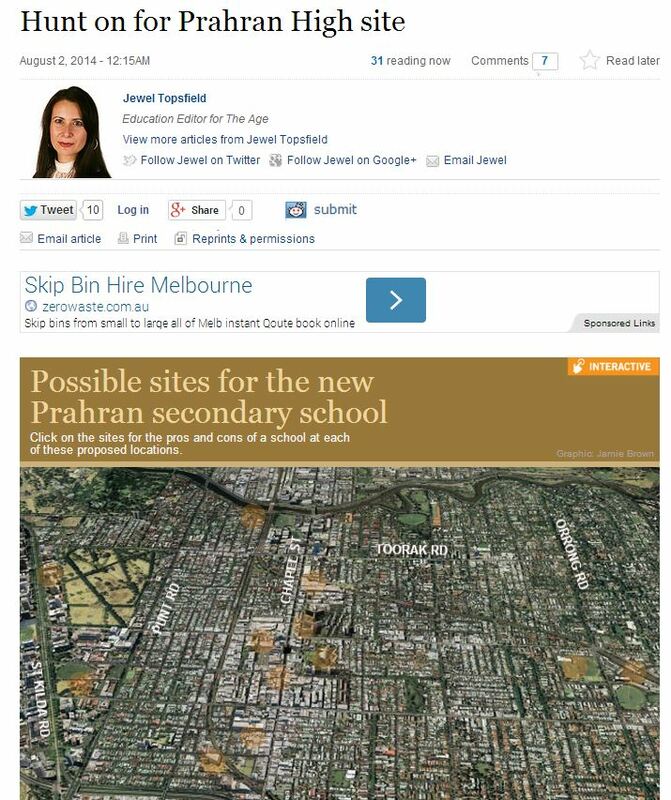 Let’s pay what it takes for the best location for Stonnington’s education. We wonder if Council and the community will be listened to this time. Stonnington Council Mayor Cr Adrian Stubbs has revealed Council’s preferred location for the site of Stonnington’s new secondary school in the Stonnington Leader. Read all about it – then write to the Stonnington Leader expressing your support. Let us be clear – we haven’t held off Lend Lease by not making our views known. So it’s time to embrace your inner activist and get emailing. 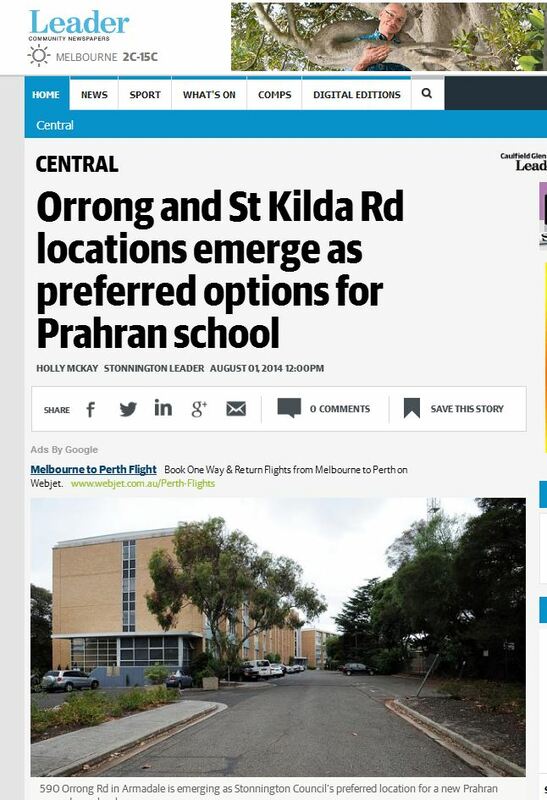 The Age today ran a report on Thursday night’s meeting but failed to mention 590 Orrong Road as the leading contender. Less traffic than alternatives for drop-offs. Jewel Topsfield (Age reporter) we need to talk. Care for a tour? The Age wants opinions on its Facebook page so go forth and opinionate. Would you rather see towers or nothing (with a school below the open sky)? About 70 sturdy souls people braved the elements to attend the meeting with Prahran MP Clem Newton-Brown and Department of Education executives to discuss possible locations for the new $20 million Stonnington Secondary school. Thanks to all the 590 Orrong Road supporters who attended among parents, pollies and media. We hope you agree that it was time well spent. Right now there is a long list of potential locations being considered. The decision should be made in the next eight weeks or so so we have to make our desire for 590 Orrong Rd clear NOW. We were shown the list of selection criteria by which the sites will be judged: cost,availability, site capacity, access to open spaces and activity, site access, impact on surrounding environment, future resident population requirements, proximity to other schools, co-location and integration with other facilities. Guess what? Having worked our way through the current list of criteria we can report that 590 Orrong Road meets all the criteria. All reasonable suggestions will be briefly assessed and then the will be whittled down to a shortlist. We cannot conceive how 590 Orrong Rd would not be shortlisted. That said we need your help. Alternative sites: were displayed on a map and numbered about a dozen including some long shots. The alternative locations included: NMIT (formerly Swinburne TAFE) the Jam Factory, the Victorian School of the Deaf, Cato Street car park, Como, Darling Gardens and more. None come close to 590 Orrong Road. Attendees asked about the need for room to grow, open space, public transport and safety. Interestingly student safety was not listed specifically as a selection criteria we hope this is amended. Also on people’s minds – budget. The government setting aside a miserly $20 million dollars for a school that is likely to attract 1000 students and last 100 years. Anyone who has ever renovated knows that $20 million is an unrealistic budget with which to build a school and a self-imposed limitation. 1. Sign our Change.org petition. 2. Sign up to our email so we can keep you abreast of our campaign. 4. If you attend any local primary school you need to call our convenor Margot and see how you can help. 9510 4845. Meeting – this Thursday July 31. Be there. Come to the forum, sign our petition, be a citizen. 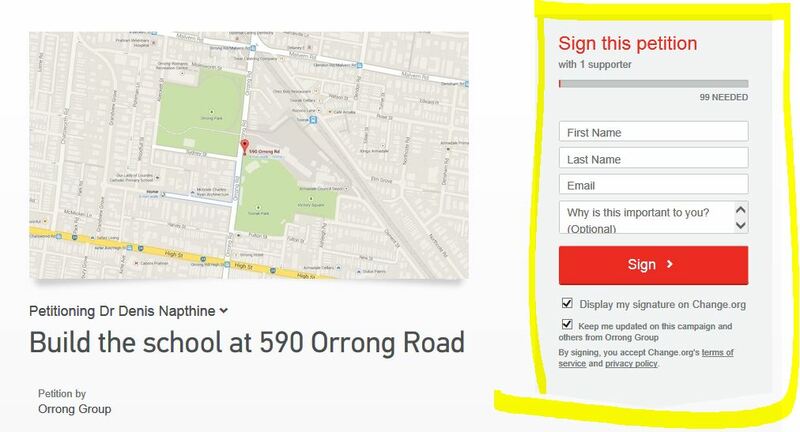 We’ll keep this simple: if you want Stonnington’s new secondary school to be built at 590 Orrong Road Armadale you need to take two simple actions. 1. Attend the forum this Thursday July 31 at 6.30pm. It’s your chance to make your preference clear to Prahran MP Clem Newton-Brown and other decision-makers. Your attendance makes a difference so postpone any hot dates / medical procedures / tropical holidays and join us. Sign up then spread the word. 2. Ensure that you and every member of your household signs our petition. Takes approx 12o seconds. The more the merrier. By taking these two actions you help reduce the chances of Armadale being blighted forever by residential towers (as is currently planned) and create more school choices for parents.